Agnes Karwirwa (right) poses for a picture with a friend at the Meru Women GK Prison. 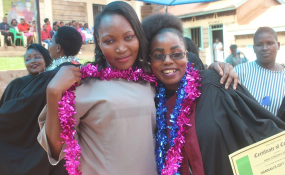 A female prisoner at the Meru Women GK Prison in Meru County has set for herself an ambition goal of becoming a lawyer once she completes her jail term. Agnes Karwirwa, an inmate who was sentenced to 10 years imprisonment in 2012 for murder, has just graduated from Hannah's Gift programme following a month's training. The inmate now says she wants to become a lawyer because course has opened her eyes on the Kenyan law. She also says her stay in the prison has taught her that the law is not there to punish law breakers but rather to rehabilitate the offenders. "A positive mentality and the will to change is what makes life comfortable in prisons. It also prevents one from falling into depression," Karwirwa says. She adds that being in prison is not a death sentence but rather an opportunity for one to reform and work towards improving and making themselves a better person. Hannah's Gift Programme is tailored to empower female prisoners and their children to view life differently once they get out of prison. "This programme has equipped me with valuable knowledge that will help me view life differently and empower my child and spouse once I'm out of prison," she said. Karwirwa is among the latest graduands of the Hannah's Gift Programme under the theme Equality, Innovating and Building Changes. The Deputy Officer in-charge of the women's prison, Espi Nkatha, said a total of 17 prisoners graduated from the programme. Ms Nkatha added that the fresh graduands also learnt innovation for small business ideas. "Building changes are projects that are measurable, attainable and realistic that help the inmates view life differently," she said. At the same time, Ms Nkatha appealed to the community to encourage the prisoners when they visit them and once they are out not to view them as criminals but to accept them as changed people.